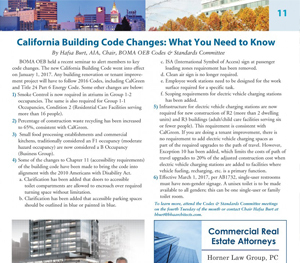 BOMA OEB held a recent seminar to alert members to key code changes. The new California Building Code went into effect on January 1, 2017. Any building renovation or tenant improvement project will have to follow 2016 Codes, including CalGreen and Title 24 Part 6 Energy Code. 1) Smoke Control is now required in atriums in Group 1-2 occupancies. The same is also required for Group 1-1 Occupancies, Condition 2 (Residential Care Facilities serving more than 16 people). 2) Percentage of construction waste recycling has been increased to 65%, consistent with CalGreen. 3) Small food processing establishments and commercial kitchens, traditionally considered an F1 occupancy (moderate hazard occupancy) are now considered a B Occupancy (Business Group). 4) Some of the changes to Chapter 11 (accessibility requirements) of the building code have been made to bring the code into alignment with the 2010 Americans with Disability Act. Clarification has been added that doors to accessible toilet compartments are allowed to encroach over required turning space without limitation. Clarification has been added that accessible parking spaces should be outlined in blue or painted in blue. ISA (International Symbol of Access) sign at passenger loading zones requirement has been removed. Clean air sign is no longer required. Employee work stations need to be designed for the work surface required for a specific task. Scoping requirements for electric vehicle charging stations has been added. 5) Infrastructure for electric vehicle charging stations are now required for new construction of R2 (more than 2 dwelling units) and R3 buildings (adult/child care facilities serving six or fewer people). This requirement is consistent with CalGreen. If you are doing a tenant improvement, there is no requirement to add electric vehicle charging spaces as part of the required upgrades to the path of travel. However, Exception 10 has been added, which limits the costs of path of travel upgrades to 20% of the adjusted construction cost when electric vehicle charging stations are added to facilities where vehicle fueling, recharging, etc. is a primary function. 6) Effective March 1, 2017, per AB1732, single-user restrooms must have non-gender signage. A unisex toilet is to be made available to all genders; this can be one single-user or family toilet room.